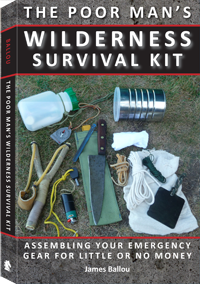 170 pages, 5.5" x 8.5"
You don't need to spend hundreds of dollars on the latest and greatest emergency survival gear for your outdoor adventures when you can assemble a functional, well-stocked kit for little or no money! Best-selling preparedness author Jim Ballou shows you exactly how to do it with this guide to collecting no-nonsense, get-the-job-done-in-an-emergency gear and packaging it in self-contained, portable kits that are always ready to grab and go. Dozens of photos show examples of inexpensive but functional wilderness survival kits, as well as step-by-step instructions for creating your own poor man's gear. If you are a hiker, hunter, camper, preparedness type, homeless nomad, or other wilderness adventurer operating within a narrow budget, this book is for you! 10) How Much Survival Gear Would a Poor man Carry, Anyway?